Foamflower found along the Hakai Institute trails on Calvert Island. Photos by Charlie Gordon (right) and Kelly Fretwell. Foamflower is a perennial species that grows from short rhizomes. The stems of the plant are upright or leaning, and grow 15-60 cm tall. 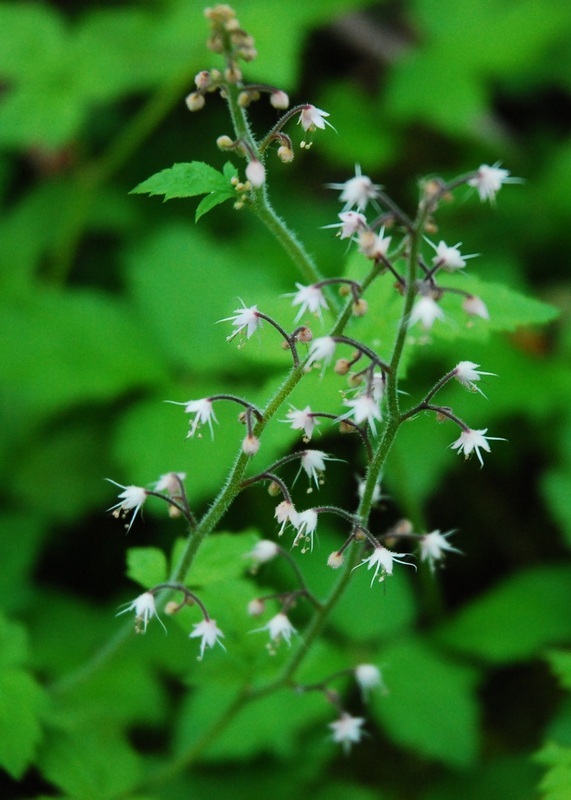 The name 'foamflower' describes the little foam-like flowers that dot the top of the plant. They are white and delicate-looking, and appear in clusters at the ends of short stalks that branch off the stem. There are three varieties of foamflower (sometimes identified as separate species), which can be distinguished by leaf shape. 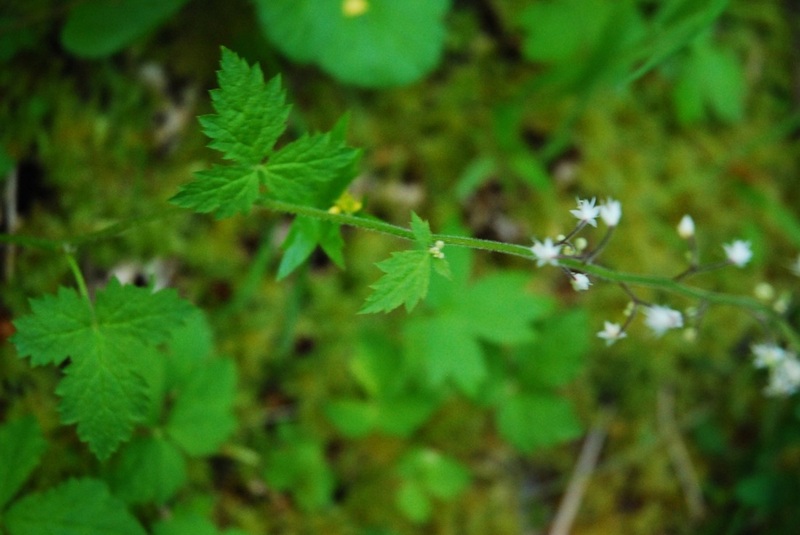 The variety pictured above, three-leaved foamflower (Tiarella trifoliata var. trifoliata), has mostly basal leaves that are roughly heart-shaped and consist of three lobed and toothed leaflets. The leaves are somewhat hairy, and branch off the lower part of the stem on long stalks. There are only a couple small, short-stalked stem leaves. One-leaved foamflower (var. unifoliata) has more maple-leaf-like leaves that are shallowly lobed, and are not compound (no leaflets). Cut-leaved foamflower (var. laciniata) has three leaflets that are much more deeply lobed than var. trifoliata. Foamflower is a common species at low, middle, and sometimes subalpine elevations. It grows in moist areas like damp coniferous forests, meadows, and streambanks. Var. trifoliata is found along the west coast of North America from the Aleutian Islands and southern Alaska to California, and inland to Alberta, Montana, and Idaho. Var. unifoliata is found at higher elevations than var. trifoliata from mid-coastal BC south, and is less common north of mid-coastal BC (to southeast Alaska). Within BC var. laciniata is frequently found on Vancouver Island, and is sporadically found along other parts of the coast including the Central Coast. Its range doesn't stretch as far north as the other two varieties. 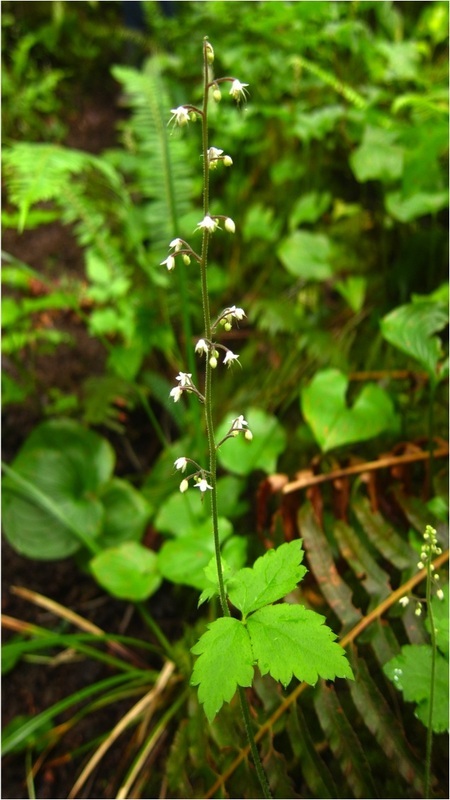 Other plants found on the Central Coast that bear small white flowers include smooth alumroot (Heuchera glabra) and small-flowered alumroot (Heuchera micrantha). The leaf shapes of these species are different, and they are commonly found in rockier habitats. Click here for information on cultivating foamflower in gardens. Foamflowers are also called 'sugar-scoops' because of the shape of the fruit capsules, which look like sugar scoops when they split into a smaller and a larger valve. Pojar, J. and MacKinnon, A. (1994). Plants of Coastal British Columbia. Vancouver, BC: Lone Pine Publishing. P. 168. Tiarella trifoliata L. In Klinkenberg, Brian. (Ed.). E-Flora BC: Electronic Atlas of the Plants of British Columbia. Lab for Advanced Spatial Analysis, Department of Geography, University of British Columbia, Vancouver. Accessed 14/08/2013. Kelly Fretwell, Ian Cruickshank, and Brian Starzomski (2013).